Introducing the first annual Brightcove Online Video Innovation Awards. During a special presentation, we will recognize some of the most innovative, cutting edge online video initiatives and campaigns. 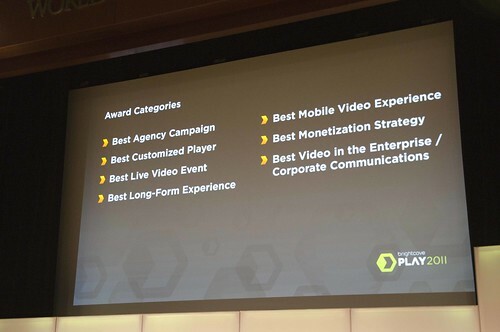 Awards will be presented across seven categories -- Best Agency Campaign, Best Customized Player, Best Live Video Event, Best Long-Form Experience, Best Mobile Video Experience, Best Monetization Strategy, and Best Video in the Enterprise / Corporate Communications. 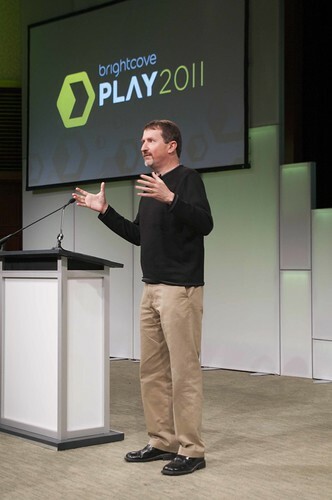 Watch the live stream of the keynote at play.brightcove.com. 11:06 David Mendels: Closing remarks. Is there any other event that brings together this diversity of people and institutions? 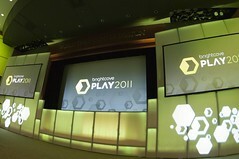 Who is fired up for Brightcove PLAY 2012? (Applause). Thank you for coming. Would love your feedback about the event so we can make it even better next year. 11:04 Whatcott: Live event participation in our Boston User Group discussions and meetups. Jesse Buckley, Daily Grommet. 11:04 Whatcott Recognizing a few outstanding contributors to the Brightcove Community Forums. Peer assistance in customers helping other customers - a lot of PLAY was about fostering that community. Appreciate your investments: when you give to the community, they give back to you. Top community leaders and contributors. For his contributes to OpenSource supporting the Ruby MAPI Wrapper: David Czarnecki, Agora Games. 10:59 Vice President for the Asia-Pacific region, Dennis Rose. presenting the award for Best Video in the Enterprise / Corporate Communications. Finalists: Oracle, Bank of America, McKesson. Winner: Oracle. 10:56 Senior Vice President of Sales for North America, Paul Goetz, presenting Best Monetization Strategy. Finalists: EMI Music, AOL Video, Sky Sports, Discovery. Winner: Sky Sports. 10:54 Senior Vice President of Global Support & Services, Elisabeth Bentel Carpenter presenting Best Mobile Video. Finalists: Financial Times, Warehouse, American Standard. Winner: Financial Times. 10:50 Senior Vice President of Engineering, Tareef Kawaf, presenting the award for Best Long-Form Experience. Finalists: The Metropolitan Opera, Lifetime, Showtime. Winner: Showtime. 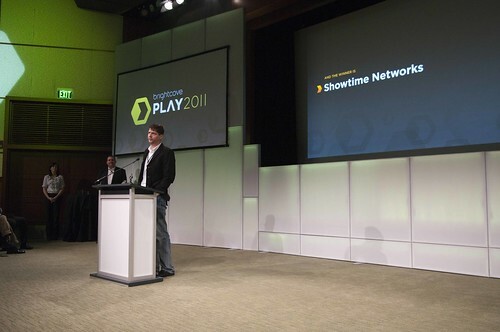 10:48 Brightcove President & COO, David Mendels, to announcing the finalists for Best Live Video Event. Finalists: Al Jazeera, The Church of Jesus Christ of Latter-day Saints, U.S. Department of State. Winner: The Church of Jesus Christ of Latter-day Saints. 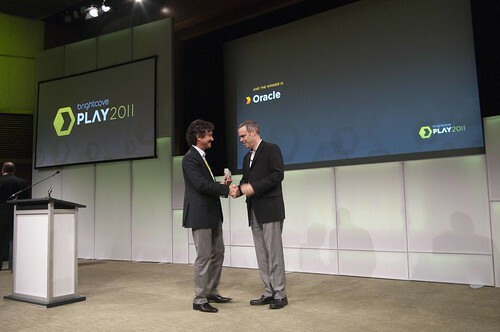 10:45 CTO Bob Mason is presenting the award for Best Customized Player. Finalists: Adjust Your Set for Thomas Pink, California Academy of Sciences. Winner: Adjust Your Set for Thomas Pink. 10:44 Vice President of Alliances and Channels, Alex Nasson presents the award for Best Agency Campaign. Finalists: Hey for Holland America Lines, Code and Theory for Calvin Klein, Innocean for Hyundai's Veloster. 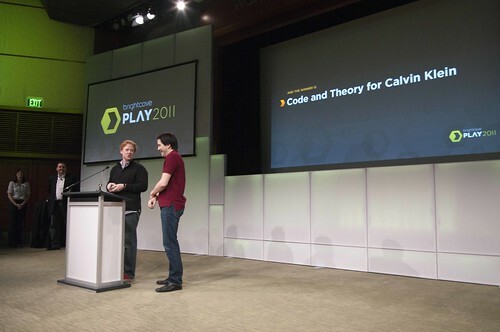 Winner: Code and Theory for Calvin Klein. 10:43 Whatcott: You are only a platform if people build stuff on you. Shares list of awards. 10:42 Whatcott: Exciting to see customers talking together, sharing best practices, sharing dreams. Inspiring to us. Day 1 we had Jeremy walk us through the strategy framework. Yesterday we unveiled the new product, brand new identity for the company. Ultimately this conference is all about you: power of innovation going on in your business everyday. Recognizing the innovation going on in our customer base. 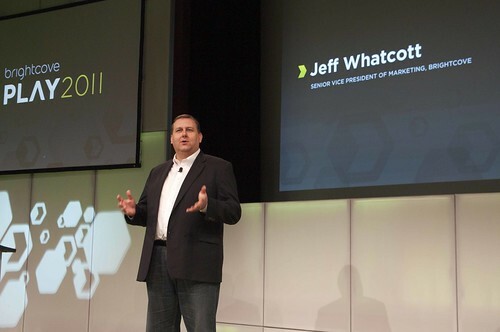 10:40 Senior Vice President of Marketing Jeff Whatcott takes the stage to present the Brightcove Online Video Innovation Awards.